Forum Index > Historical Arms Talk > What's your favorite Del Tin Sword? 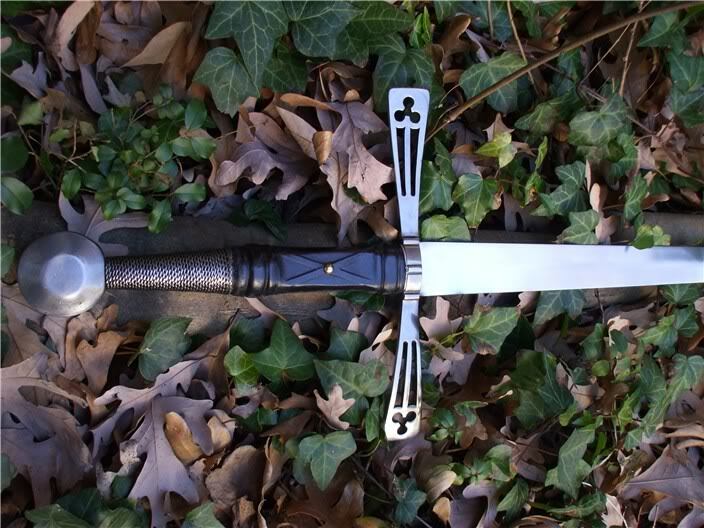 Posted: Fri 23 Oct, 2009 8:57 pm Post subject: What's your favorite Del Tin Sword? As a longtime collector, I remember when Del Tin was "top of the line" as far as sword reproductions went (along with Arms & Armor, of course, as they were just about the only game in town back in the late 70's early 80's). Presently, we are blessed with a number of excellent makers offering simply superb pieces (and yes, I count Arms & Armor among them together with Albion for sure). While some may be of the opinion that Del Tin is, in general, a notch or two below the top weapon smiths, personally, I have always loved them and in my opinion, they still produce some really nice pieces, many of which are unique and not available from other manufactorers. The first "real" sword reproduction I ever bought was the Del Tin Scottish Baskethilted broadsword, and it's still one of my favorites today. They haven't made it for 15 to 20 years but I noticed a picture of one can still be seen on their website. Its right up there with their Sinclair Saber which can be seen on this website-- formerly part of Nathan's collection. Anyway, owning over twenty Del Tins, and having an admittedly nostalgic and sentimental attachment to the company, it got me thinking about which one would be my favorite, if I had to choose. It also got me pondering whether others felt the same way as me, and had a special afffection for this craftsmanship of the Del Tin offerings. So I am curious about what other forumites who own or are familiar with Del Tins think about them in general, and specifically which Del Tin piece or pieces are their favorite. I am surprised how difficult it is for me to pick just one as my favorite as there is such a wide range of choices, and it changes from time to time. Right now the best I could do is say there is a three-way tie with my Baskethilt, Sinclair Saber and Shiavona. So what do others think? What is your favorite Del Tin? The 5155 Gothic Hand and a Half, hands down. Quite a few of the Del Tins run a little heavy, but not this one! I've the slightly larger 5157 and like it a lot. One I have had a long time and have never found for sure what it was listed as. This one is a favorite sword from my walls and a first go to for playing with cane in the back yard and trimming vines. This one has a spin on pommel that shows up on a few older MRL swords and if the thought is correct, it was listed as the Danish War Sword. I just know it is a dandy and lively little single hander. I had scooped it from the second hand classifieds on one of the old boards. My favorite is DT5144 a type XV, based on an original from the early 14th C. I've worn it on stage a few times, though never for stage combat. It is a great looking sword. I absolutely adore my 5155 Gothic......one that I will never part with. 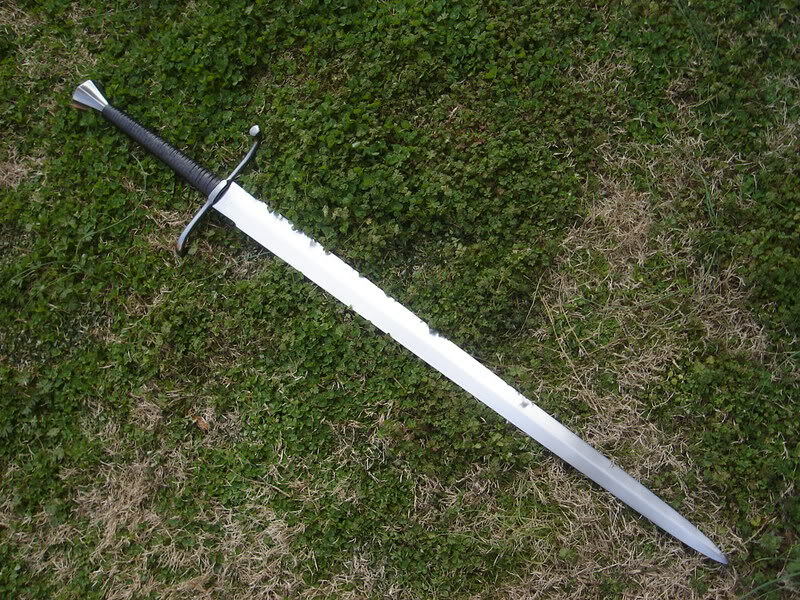 I love my DT 204a celtic long sword. And yet another favorite is the 2104 Viking sword. 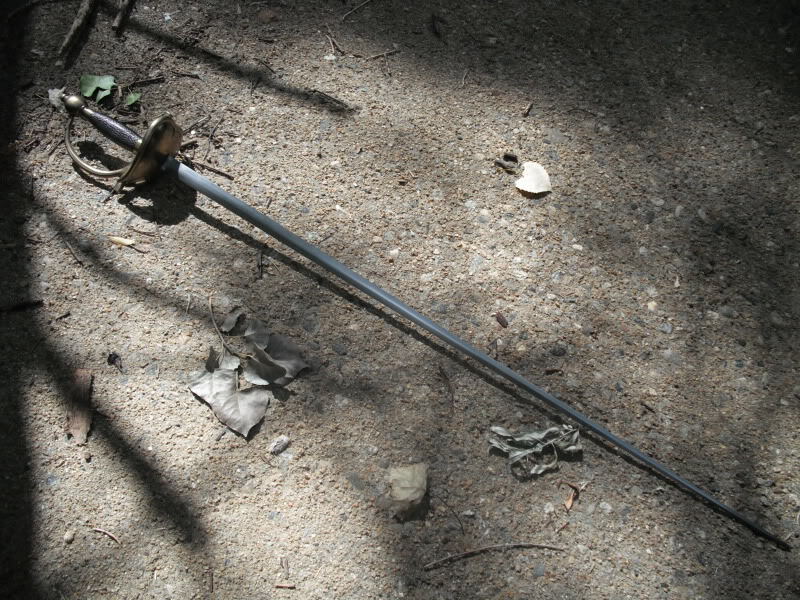 Weight is okay, right at 3 lbs, not too far off from the original Witham sword. Balance is good too. The 2104 and 2105 are the two Viking swords that Del Tin did a pretty good job with; the others tend to be too overweight and/or poorly balanced. I have owned a number of Del Tins over the years but do not currently own any as complete swords. I have used a few Del Tin blades as the base for custom projects and they are a favorite of mine for this purpose, although they usually require some grinding to bring them to into balance and create effective cutting geometry. 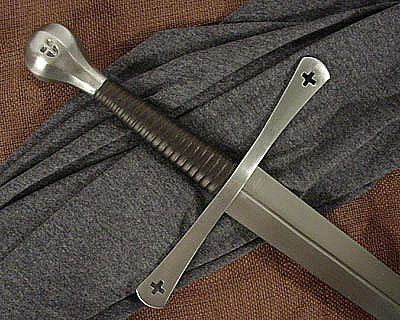 My favorite, although I have never seen one in person, is probably the 5154, the famous sword used in "Braveheart". 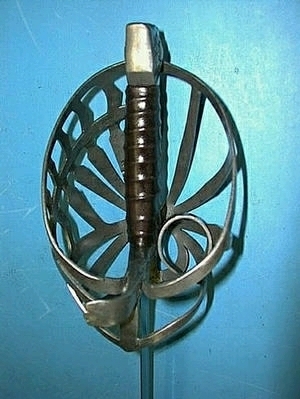 Although the movie is antihistorical to the point that I can barely stomach it, and the sword is so out of context in the film, it is (IMO) one of the coolest swords ever to grace the silver screen and it's appeal is demonstrated by the huge number of knock-off import wall-hangers which still abound on Ebay. It created it's own niche market which was an open door to the import sword market and I think when many non-swordy people think of a European sword, this is the image which first comes to mind. I have had two Del Tins that I have absolutely loved. The first is a DT 5140, that has had a major Albion tune up. They pulled it apart and hot peened the cross guard into place, then peened the pommel. The grip is tight, and the sword is incredible for my workouts. Of course, I had to grind the tip a little for safety. I will never be parted from this sword!! The other I really loved as well was an Albion Mark 2160. Of course, it was also assembled in the Albion way, and the sword had major presence. I wish I had kept that one. Regarding that 2135, I also just noticed that same sword on the Del Tin website and was going to ask if it was a new piece. I never noticed it before, but it didn't come up when I clicked on "new items". Its also not showing up on the "a work of art" website. I agree with you and also think it's a very nice looking piece. Not sure how I could have overlooked it if it's been there for a while. It has a very appealing aesthetic, and I would love to check out its balance. Anyone ever handle/see this one before? It may have to get added to the list. I'm also a big fan of Del Tin swords, and I like quite a few of them very much. My current love affair (alas, from afar), is the new 5159 (http://www.deltin.net/5159.htm) which I have handled recently. It's quite light, excellently balanced, and feels like it could perform at least as well as the original that it's based upon. I own the old Windlass version of this sword, and even though it was a fair attempt for them at the time, the 5159 just blows it away! I also have Del Tin's old Irish ring pommel sword, sold by MRL about 20 years ago, and I like it quite a bit, too. I think I have about 9 Del Tins at the moment, not counting a few Mad Piper claymores with Del Tin blades. Even now, for the money, Del Tins are hard to beat as display pieces - they just have that...look. Plus, they're still really decent replicas. I've never seen it before. It could be a return of an old model, but most likely, it is new. I've got to say it is very attractive. Mine is the 2130 Sword of St Maurice (Turin). It is quite the beast. 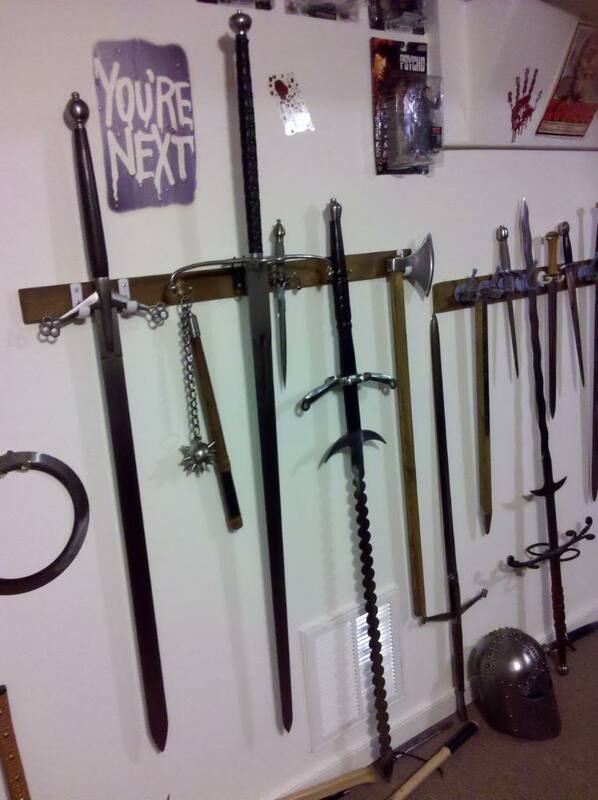 My favorite is the Del Tin Type X Medieval Sword - DT2133. This sword has great balance and is not heavy at all. Mine came with the wire grip loose and I removed it and did a cord/leather wrap. Has a beautiful brazil nut pommel. Del Tin development is hampered by the absurdities of the italian law, which still classifies sharp blades as real wepons, so that to build sharpies one should receive a permit for weapon building, while having to undergo much red tape to sell even a single sword, esp. Abroad. 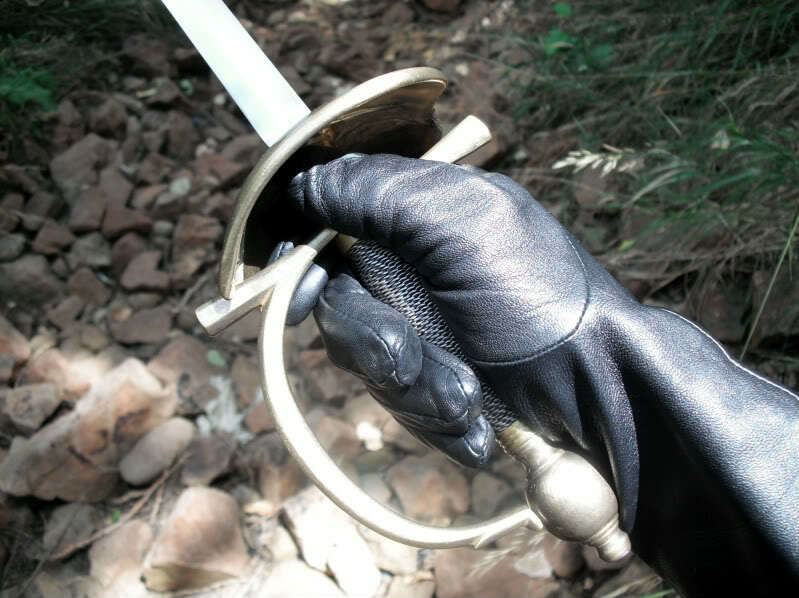 This way no swordmaker can evolve in Italy, being forced to build thicker blades devoid of a true historical geometry. 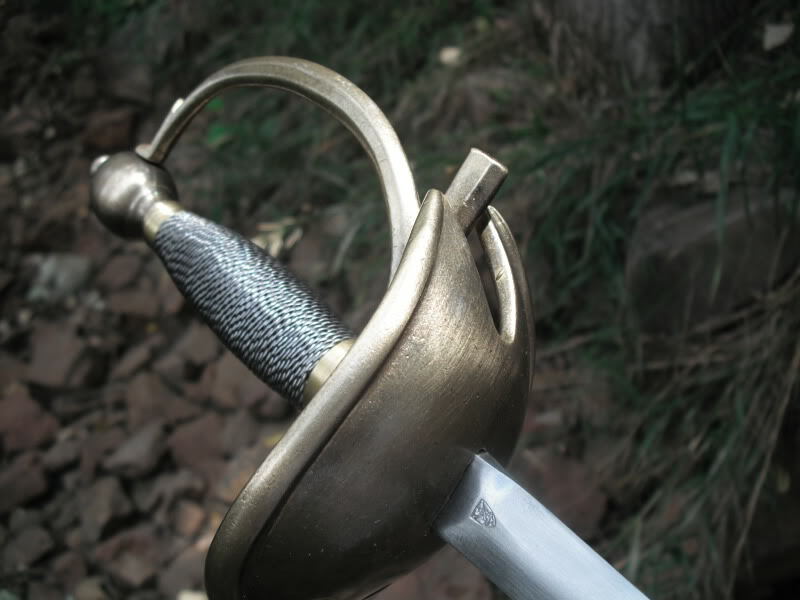 Such blades cannot fairly compete with historically correct blades, regardless of how much care one could put in reproducing hilt components and blade profile. Its a big problem we have in Italy, as while firerms maker and enthusiasts may count on a powerful lobby, blademakers and blade enthusiasts are too few to cause a change in archaic laws. Possibly a solution would be for Mr Deltin and others to have their blades finished elsewhere in the world where laws are more modern. Otherwise any italian sword industry is doomed to be never fully born. My favorite is the two-hand Scottish claymore. I purchased my first one from MRL way before the days of the internet...lol. Its at least 25 years old and looks as amazing as the day it arrived. The 59 inch beast is a sight to behold in person yet is lighter and swifter in hand than it may appear. I still have the MRL catalog I ordered it from and it makes special note of Krupp steel. I own many two hand claymores but this early Del Tin is just so elegantly menacing. I really like Del Tin's later-period stuff. 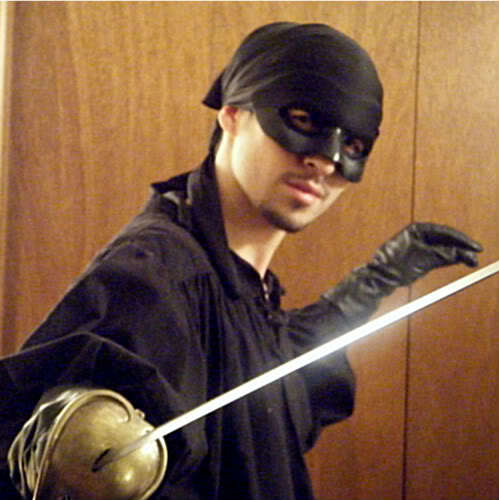 My favorite Del Tin is this french smallsword, just a perfect swift swashbuckler!